A deviated septum will have to be corrected with surgery – septoplasty. The sooner the better, because this organic defect in the future can cause a lot of complications. A deviated septum is rarely congenital. This is usually the result of trauma. Especially in childhood, when toddlers learn to walk and often fall. While teenagers often get such injuries in fighting sports. Many parents do not attach importance to them, seeing the curvature only acceptable cosmetic defect. Especially when the owner of such a nose – boy. And this is misleading. Anatomical defect of the nasal septum makes itself felt much later, in a few decades. Due to the deformation of the nasal passages air flows into the lungs with difficulty, and the body chronically loses the required amount of oxygen. Oxygen starvation affects almost all organs. The first signs – yawning, drowsiness, and headaches, frequent depression. The main target of chronic hypoxia becomes itself nasal apparatus, dried and thinning the mucous membranes of the nose can cause nasal bleeding and disorders of smell. Those who have deformed nasal passages, often suffer from rhinitis, a pharyngitis, which become chronic. Appears snoring. Brings a lot of suffering sinusitis, when I have to fight inflamed sinuses. Oxygen starvation is very harmful to the brain – can slow down mental development. For the heart is forced to work in a constantly busy schedule. Over time it can grow and become hypertrophic. In addition, rapidly developing hypertension. Oddly enough, the curvature of the nasal septum can cause the weakening of hearing. People hears worse in his left ear, if more narrowed left nostril, and Vice versa. May worsen also vision. Finally, because of a defect of the nasal septum is limited to the physical capabilities of man. At higher loads, it doesn't have enough air, and develops dyspnea. 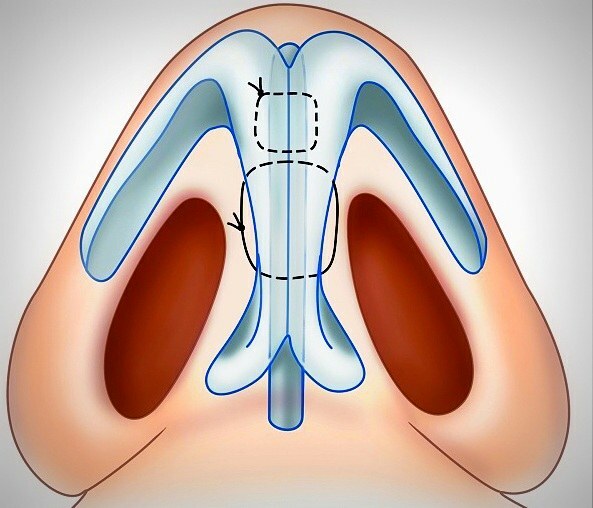 Septoplasty – straightening of the nasal septum – has long been a common operation in ENT practice. It is performed under local anesthesia, when the curvature is negligible. If surgical aid is quite big and long, using General anesthesia. In General terms the operation is as follows: either remove the deviated bone or nasal septum is heated using a laser or electrocautery. Cartilage plate becomes soft and easy to straighten. Then in both nasal stroke impose tight gauze turundy that support the new shape of the cartilage. After cooling, it hardens, and the nose retains the shape imparted. And no plaster, as it was before! The only thing that is quite annoying – you have to survive the first days after surgery. Because nasal breathing is blocked, and you have to breathe a dry mouth. But what a joy when turundy removed and is completely free to breathe full breast!